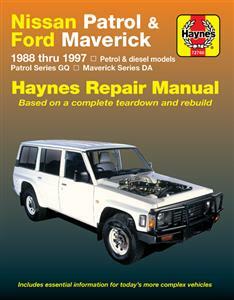 Haynes repair manual for the Nissan Patrol GQ 1988-97 with 3.0 & 4.2 petrol and 4.2 non-turbo diesel engines. Does not cover 2.8 models. The import Safari is the same vehicle except that it has a 24 volt electrical system.